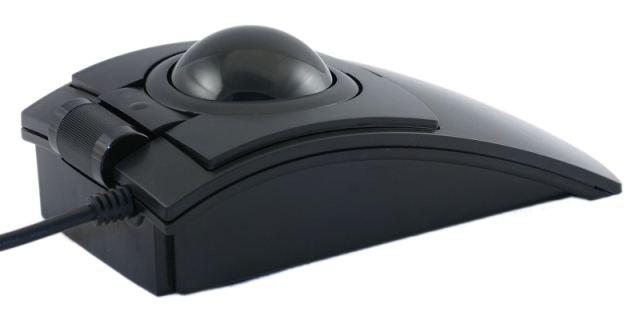 The Clearly Superior Technologies L-Trac is a high performance laser optical trackball with a large ball (2.25" diameter). The design is completely ambidextrous, accommodating either right or left-handed users. The extra large ball and contoured profile allow for easier control and accommodates hands of all sizes from children to adults. Hardwired into the trackball is its unique ability to dynamically accelerate across the screen in response to the speed with which you move the trackball. Model CST2545W has a black case, black buttons, black cable, black ball, with scroll wheel. Selectable resolution: 400, 800, 1600 DPI. L-Trac Trackball Mouse placed to the right of a Freestyle adjustable keyboard. L-Trac Trackball Mouse placed to the centre of a Freestyle adjustable keyboard. L-Trac Trackball Mouse placed to the center of a Goldtouch adjustable keyboard. L-Trac Trackball Mouse placed to the left of a Goldtouch adjustable keyboard. 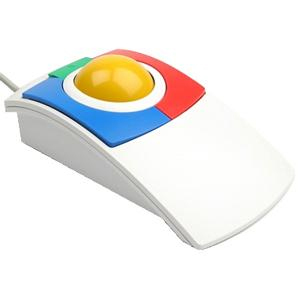 L-Trac Trackball Mouse with a compact S-Board Keyboard. L-Trac Trackball Mouse with an Evoluent Keyboard.